If reading academic journals isn’t part of your daily routine because you’re too busy chasing your children around, packing lunches, working, picking up your children and making dinner, you might not be aware that executive functioning is one of the hottest topics in education right now. Executive functioning, also known as executive control, includes the abilities to control yourself, plan ahead and pay attention. In other words, executive functions include the necessary skills for “adulting.” Helping children develop these skills prepares them for success in school, careers and life. Here are four ways you can help your child develop these crucial skills at home. Play memory games with your child. 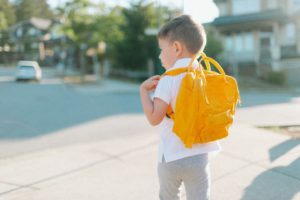 Start with something simple, such as peekaboo, and move on to other developmentally appropriate games, such as hide-and-seek, as your child grows. Playing these types of games will sharpen your child’s working memory, and they’re fun, too. Develop routines to get your child to help with household chores. Requesting your child’s help with simple tasks, such as taking out the trash, sweeping and helping wash dishes, can help strengthen your child’s ability to focus on one task at a time and filter out distractions. Make sure these chores are developmentally appropriate, of course. Find fun ways to engage your child’s executive-function skills, such as assembling puzzles. Whether you’re working on a 1000-piece picture of Mt. Everest or a simpler one, assembling a puzzle can help your child develop the abilities to focus, plan and organize. Talk to your child about your day. A great way to do this is when you’re at the dinner table – each family member can talk about his or her day and highlight any favorite moments. Discussing what you do on a day-to-day basis and how you accomplish various adult tasks can provide your child with insight into how you use your executive-function skills. You can also ask your child how she would handle some of the situations you’ve encountered, which allows her to reenact real-life scenarios in a safe, consequence-free way.